Heavy duty yet lightweight plastic slabs made from recycled polyethylene. 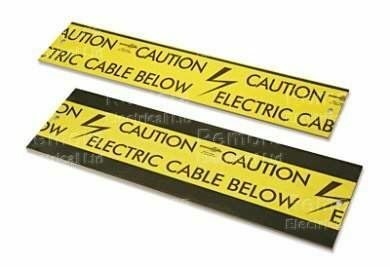 The top surface of the covers is laminated with a yellow plastic tape which has been pre-printed with an identification warning text. The covers have a hole at each end to allow interlocking by simply overlapping and securing using the special plastic joining pegs. The covers are free from PVC and made from homogeneous recycled plastic which is not susceptible to freeze-thaw cracking that may occur with compressed-plastic-chip covers.